While the crust was cooling, I chopped the chocolate for the ganache layer. The recipe calls for four ounces (120 g) of chocolate melted in a quarter cup (60 ml) of heavy cream. While the Elsens recommend a 70% chocolate, I used Valrhona Noir 68% “Rond et chaleureux” for this recipe, because of all the chocolate I had, it was closest to the desired quantity. 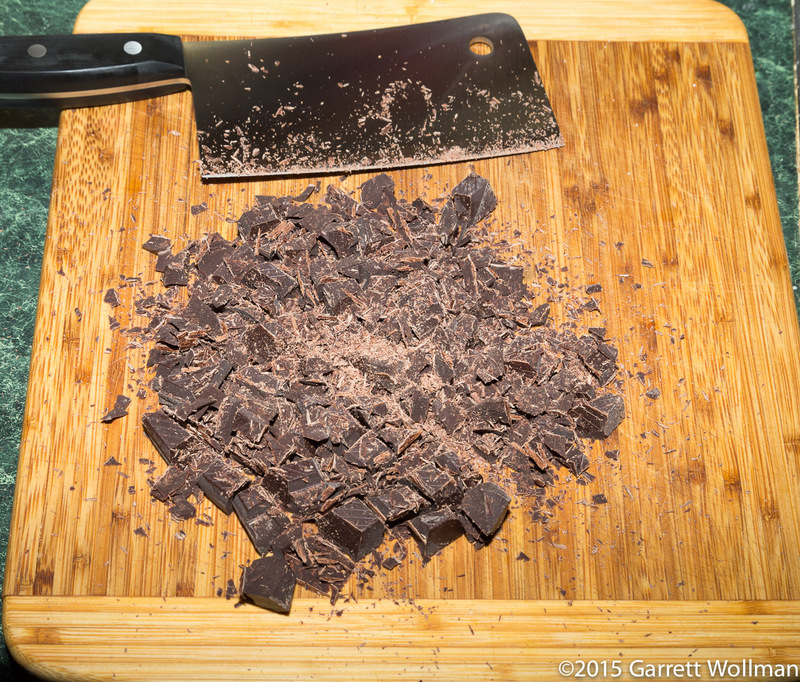 A cleaver makes quick work of chopping the chocolate into small bits, which are then added to the boiling-hot cream to make ganache in the usual way. 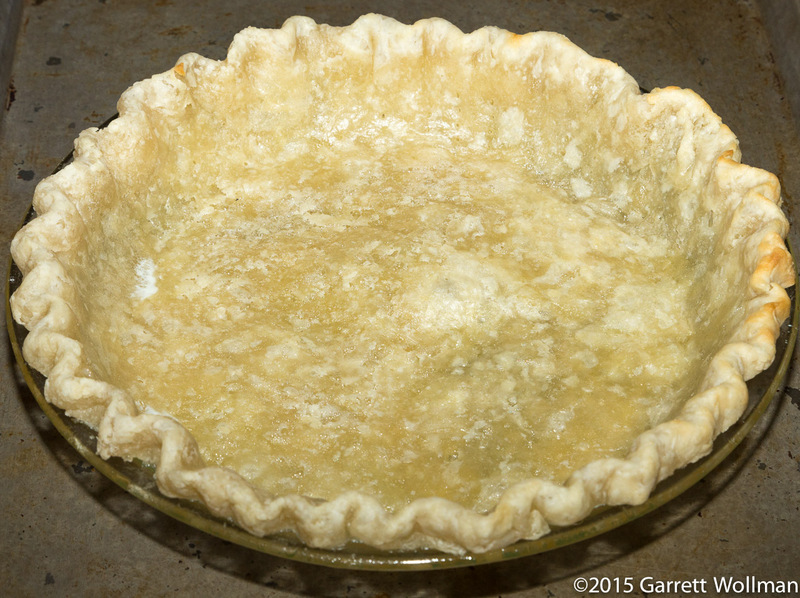 This is spread evenly across the bottom of the pie shell, as well as halfway up the sides, to form an impervious chocolate layer which should keep the crust from getting soggy even if you don’t use an egg-white glaze as I described in the tutorial. The chocolate-coated shell is refrigerated to set the ganache, and meanwhile we proceed to make the custard. 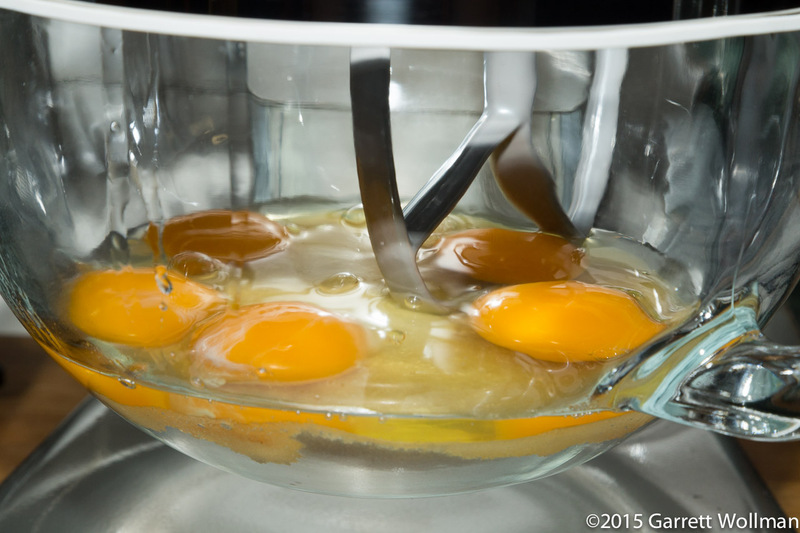 The base of the custard is eggs and sugar, which are beaten together until foamy. This particular custard calls for one extra egg yolk — which is why I used the egg-white glaze, since that extra albumin would otherwise simply get thrown away. 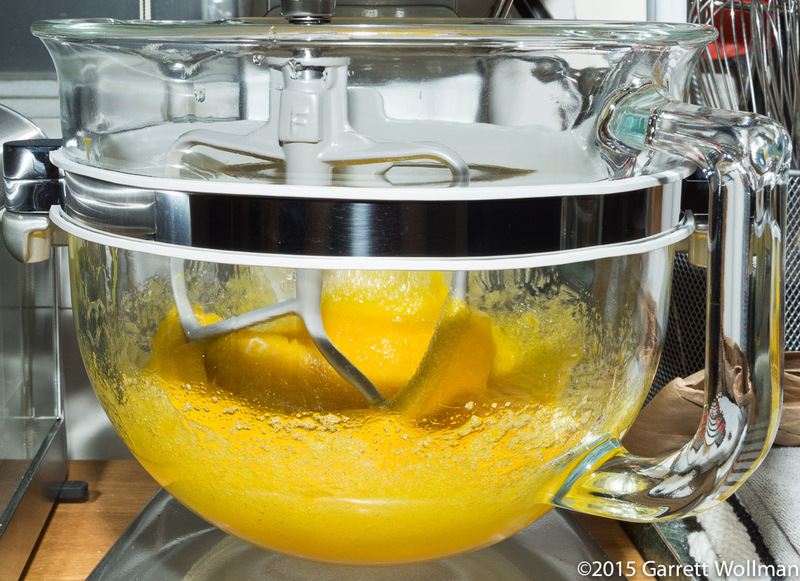 Beating the eggs and sugar together into a thick foam, as seen here, helps to keep the egg from coagulating when the highly acidic lemon juice is added in the next step. In addition to three Meyer lemons’ worth of juice, a quarter-cup of orange juice — I ended up using Cara Cara navel orange juice, because those were the oranges I had — is added. 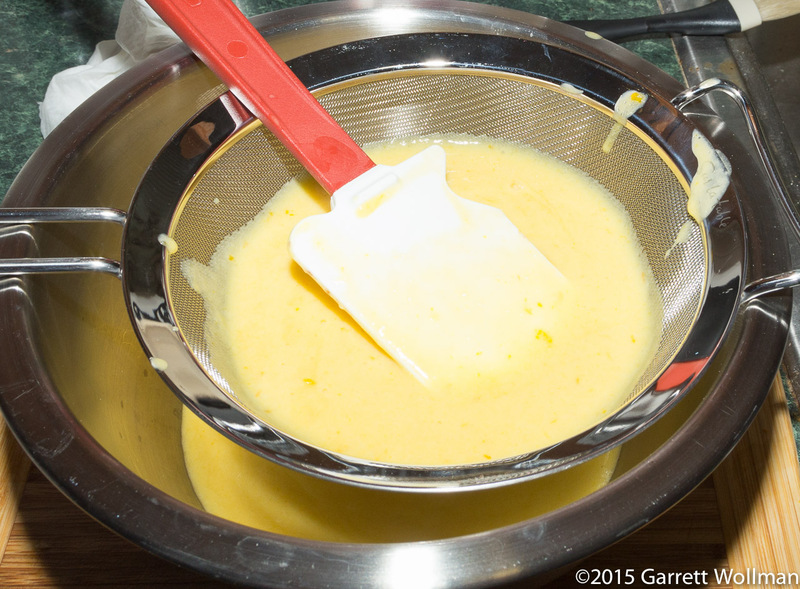 Note well: because the citrus juice is the principal flavor in this custard, make sure to use glass, plastic, or ceramic bowls to hold the juice as you extract it — a steel bowl, even stainless, will leach metal ions into the juice, giving it an off flavor. The recipe also calls for both orange and lemon zest, which you can just mix in with the juice as a part of your mise en place — the juice will help extract some of the flavors from the zest. Finally, additional fat is added in the form of more heavy cream. 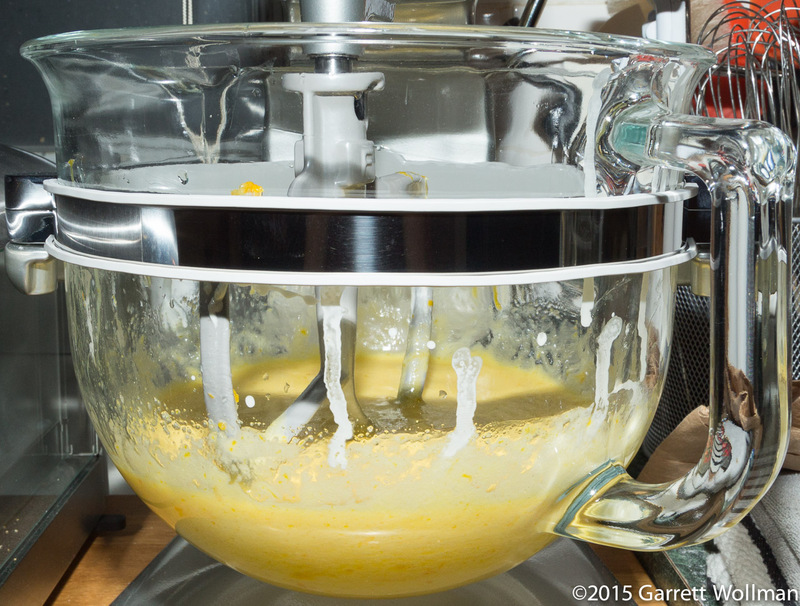 After mixing the custard, it looks like this — but we’re not quite done yet. It’s common practice to strain custards through a fine-mesh sieve. This ensures that any unwanted stringy or coagulated bits don’t interrupt the creamy texture of the cooked custard. 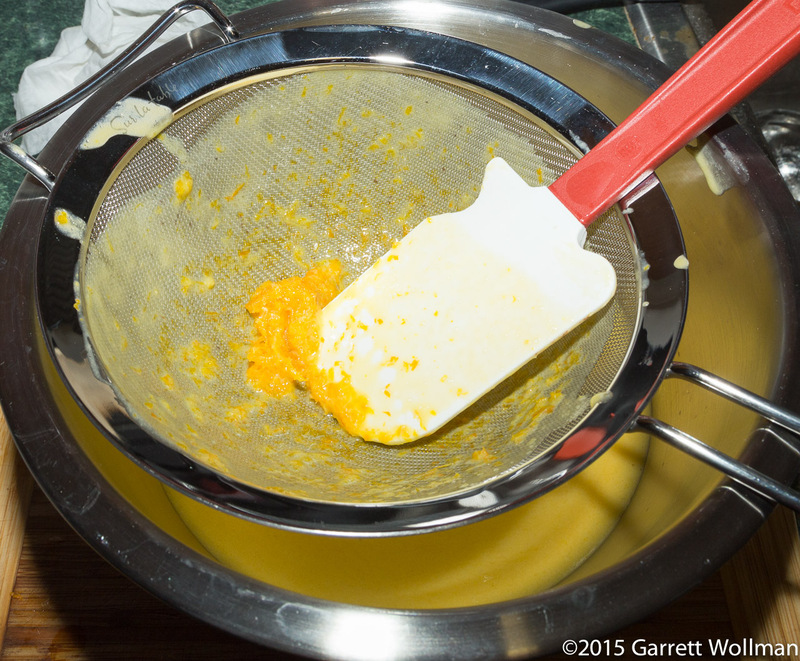 Most of what was strained out in this case turned out to be orange zest. The strained custard is then poured into the pie for final baking, on a sheet pan on the middle rack of a 325°F (160°C) oven. 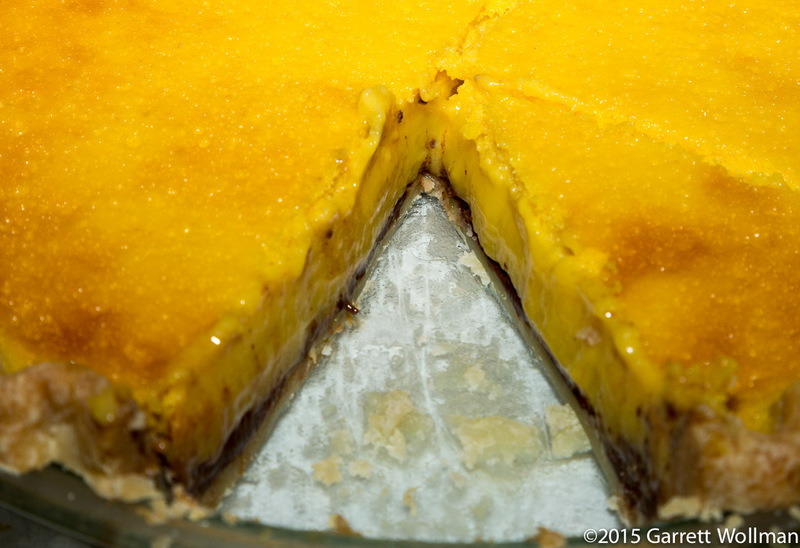 The recipe says it should bake for 25–30 minutes, but I found that it took 40 minutes for the custard to be sufficiently set around the edges. 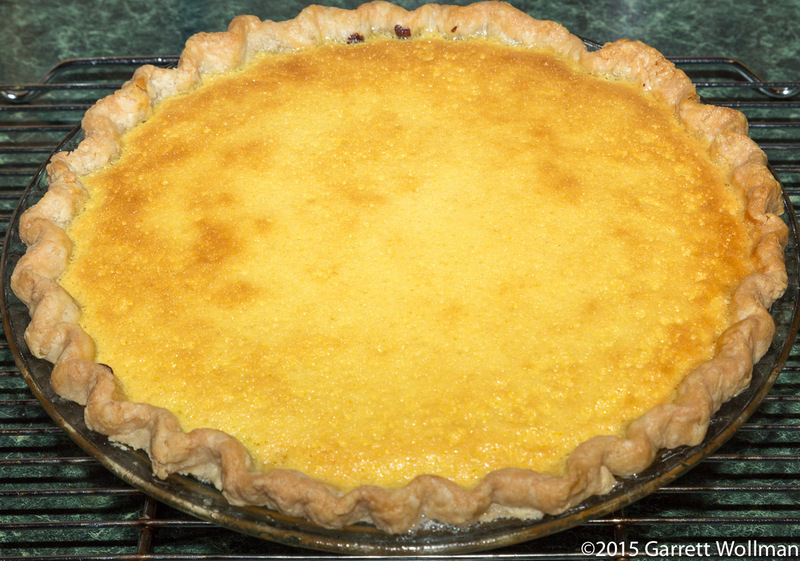 Because the custard will continue to cook after the pie is taken out of the oven, it should not be completely set, but if the custard forms tall waves when the pan is jiggled, it’s definitely not done yet. 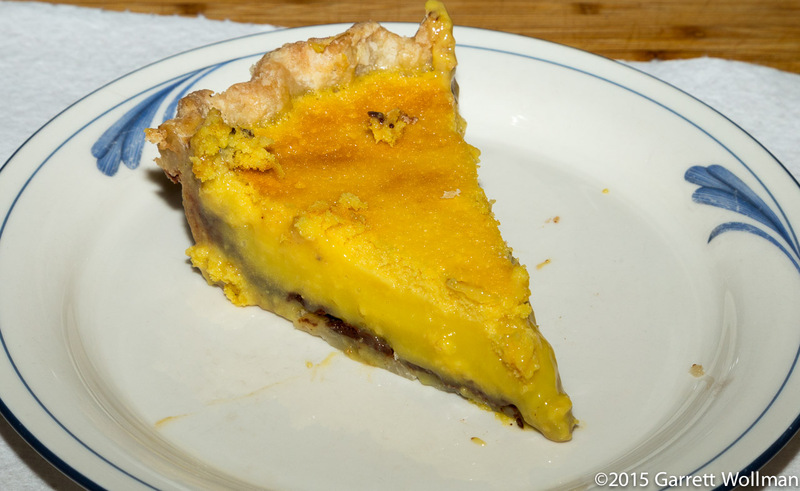 Whatever the surface defects, however, the interior of the pie is absolutely perfect: creamy custard, solid ganache, and buttery pastry crust. The values below were computed using Valrhona Guanaja 70% rather than the 68% chocolate I used. I do not expect a significant difference. This entry was posted in Food and tagged black bottom, chocolate, custard, Four & Twenty Blackbirds, fruit pie, lemon pie, pie, recipe. Bookmark the permalink.